USGBC releases Top 10 LEED States for 2018. MA comes in 2nd. 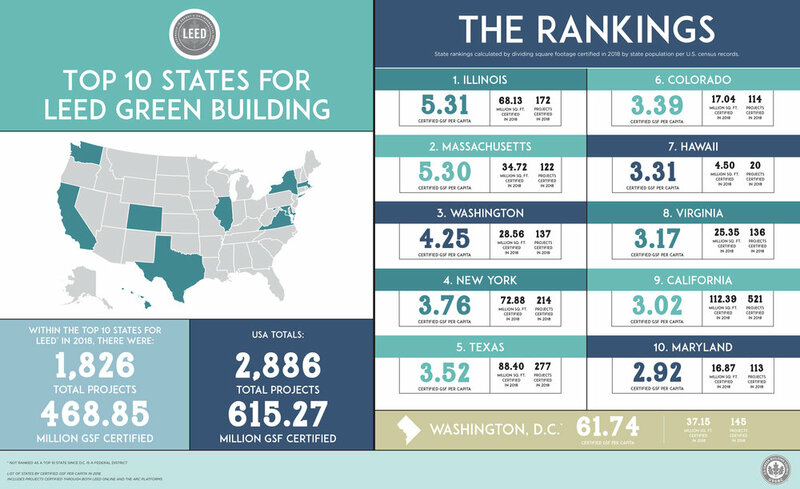 — The Green Engineer, Inc.
USGBC releases Top 10 LEED States for 2018. MA comes in 2nd. The USGBC has released its ranking of the #Top10LEED States for 2018. For 2018, MA came in second, with 5.30 certified GSF per capita, second only to Illinois with 5.31 GSF per capita. The USGBC’s list ranks states based on the number of LEED certified square feet per person. The Green Engineer provided sustainable design consulting services on 18 of the 122 LEED certified projects in MA last year, representing 14.75% share of the Bay State’s LEED Certified buildings. According to the USGBC, 'the Top 10 states for LEED are home to 128 million Americans and together include more than 468 million gross square feet of LEED-certified space. Read the USGBC's full press release here and additional details & infographic here.